If you can afford to invest in Georgian jewelry crafted from genuine gold and fine antique gemstones, you will not be disappointed in the treasures available on the open market. All Georgian jewelry is historical, but the best of the best utilised the finest materials available to the lapidaries of the era. Unlike their modern descendants, the list of gemstones pre-dating the Victorian era is nearly always untreated, and the rich glow of Siberian amethysts, Imperial topazes, Muzo mine emerald gemstones, Persian turquoise and Natural Pearls cannot be imitated. These gems are usually set in high-karat gold mountings, but the use of 9k gold for rings was very common, as rings needed the strength of a lower karat gold for "everyday" wear. Additionally, until c.1810, paste and gemstones alike were mounted with either silver or colored foils behind the closed-back settings, which gave fantastic refraction under the low candle- or gaslight of the period. Georgian jewelry was meant to be seen in low light, but modern lighting does not detract from the special qualities of the antique settings. Many estate Jewelry collectors are not familiar with the jewelry of the Georgian era which spanned from 1714 to the 1830s, and those who are assume that pieces of this early period are very difficult to acquire and too expensive to collect. Authentic Jewelry of the Georgian era is indeed highly sought-after, and for many good reasons - it is magnificently crafted (usually by hand), beautiful to behold, and wonderfully wearable. The Rococo and Neoclassical designs of the Georgian era have become classics that transcend time. Georgian-era jewelry is one of the best investments around and the savvy collector can easily find examples and invest in gold Antique Jewelry and Georgian jewelry that has survived up to two and half centuries, in the best condition possible. One should concentrate and Jewelry of the 18th- and early 19th century ought to show some evidence of gentle wear over its long history, but pieces that are badly damaged or incomplete will not appreciate in value nearly as much as good quality examples. And as scarce as it might seem, when you are thinking about how to invest money in Georgian jewelry, keep in mind that there is still a wide range of genuine Georgian jewels available for purchase from reputable and educated dealers. It is true that the increasing interest in jewelry of the Georgian period over the past 20 years has made examples harder to find than jewels of later periods, but there is still a wealth of both fine and costume Georgian jewelry on the market waiting for any collector willing to do a bit of research, either through books or internet sources. Moreover, this interest has increased the demand for and consequently the value of these historical jewels. The popularity of the Greek key pattern in the late Georgian period is a good example. Depending on your budget, you can invest in Georgian jewelry ranging from fine Georgian examples (those crafted from high-karat gold and fine gemstones) to Antique costume jewelry, crafted from paste (glass) gemstones. That fabulous gold substitute, pinchbeck, which has the look and heft of 20k gold at a fraction of the price is also worth investigating. When you invest in Georgian Jewelry, whether it be a dazzling pair of 1780s rose-cut diamond earrings or simply a beautiful 1820s pinchbeck and paste bracelet, you can be assured that your investment will always pay off, even in the short term. Need an Online Jewelry Appraisal? It will Never Lose Its Value! When you invest in Georgian jewelry, it will never lose its value; it is recession-proof and will only increase in price over the years. If you are new to the world of Georgian jewelry, you are in for a treat, as it is like nothing that which came afterwards in the world of antique ornamentation. Unlike jewelry of the Victorian and later periods, Georgian jewelry always involves some hand-craftsmanship on the part of the lapidaries of the era. These jewels were made before the Industrial Revolution of the 1840s, and the crafting of pieces was very labor-intensive. It is not unusual to see tool marks on the backs and findings of Georgian jewels, and all of the stones, whether precious or imitation, were set by hand. For instance, a lapidary had to be a true expert to craft paste jewelry as the silver mountings had been worked around the stones rather than the other way around. The softer pastes could not take the heat necessary to set diamonds, which on the Mohs Scale are the hardest gemstones known to man. As a result, "paste" Jewelry of the Georgian era has a singular beauty, and is usually of the highest quality. Even the aristocrats of the Georgian era proudly wore "paste" jewelry, and it was crafted in great quantities, although its seeming lack of intrinsic value at the time often led to these fashionable jewels to the fate of the melting pot when silver was in high demand. 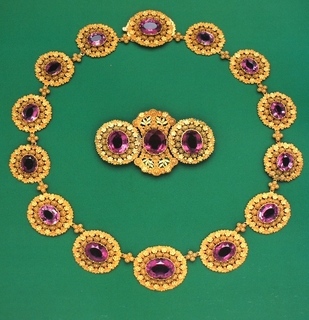 Nevertheless, "paste" often referred to as rhinestones in the United States has become one of the most popular forms of Georgian jewelry for 21st century collectors, as its magnificent sparkle and surprising affordability are attractive to those in the know and keen to invest in Georgian jewelry. Many collectors invest in Georgian jewelry begin with "paste" examples, and build up beautiful collections! The Georgian era covers nearly 120 years in the history of jewelry and each period should be well understood by any collector venturing into this wonderful world of early jewelry. Georgian Jewelry designs, materials and fashions have a distinct character. I encourage all collectors to consider Georgian jewelry as a sound investment that will bring endless pleasure.